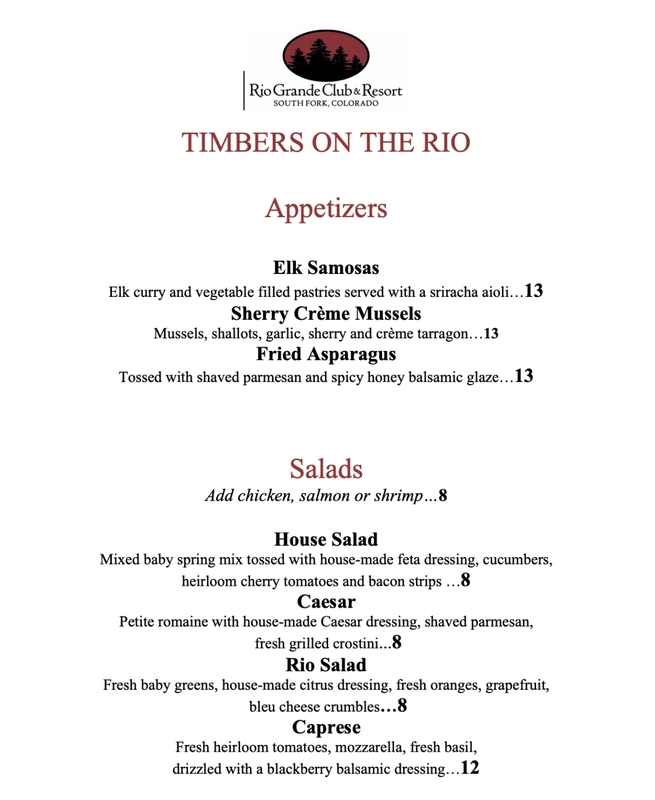 The Rio Grande Club & Resort offers two different restaurants open for the public to enjoy the views of South Fork and the Rocky Mountains. Views are in abundance as you whet your appetite on the rising San Juan Mountain Range and the tumultuous challenge of our nationally recognized 18-hole golf course. 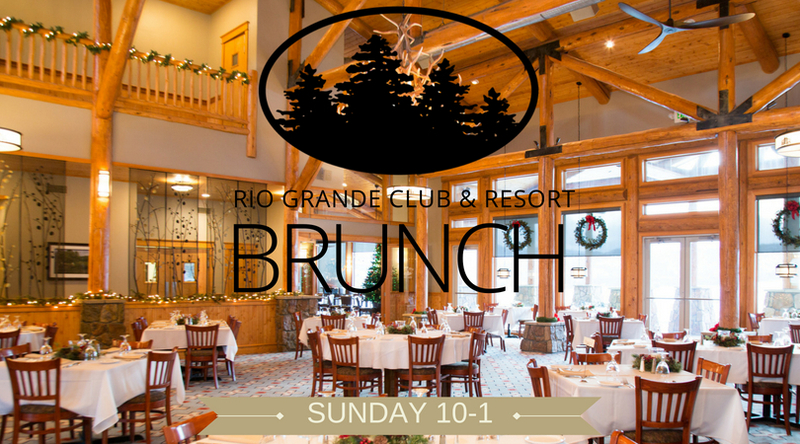 The culinary experience at the Rio Grande Club & Resort is paralleled by its awe inspiring surroundings. A menu that takes old world tradition, all natural ingredients, and progressive American culinary inspiration to satisfy a wide array of palates is awaiting our members and guests alike. Our steaks are hand cut from the finest beef. We use organic poultry and produce whenever available. Sauces, stocks, and breads are made fresh in our kitchen from the finest ingredients. The kitchen takes a dedicated approach to provide consistency in all of our meals while being flexible and innovative in creating unique entrees and accommodating special requests. The wine list is comprised of a wide array of red, white, and sparkling wines from around the world. The selection encompasses well known favorites, Wine Spectator top 100 rated wines, and hidden treasures waiting to be discovered. Big River Grille...stop by and be refreshed. The perfect place to start and finish your day of golf or other activities is the Big River Grille which overlooks the crystal clear pond of the 18th hole. Lunch items served at the Big River Grille include fresh salads, homemade soups, hearty sandwiches and juicy burgers with your choice of toppings. Enjoy your meal outside on the patio with an icy cold beer or beverage of your choice while taking in the beautiful vistas surrounding you. Great for golfers and non-golfers alike. 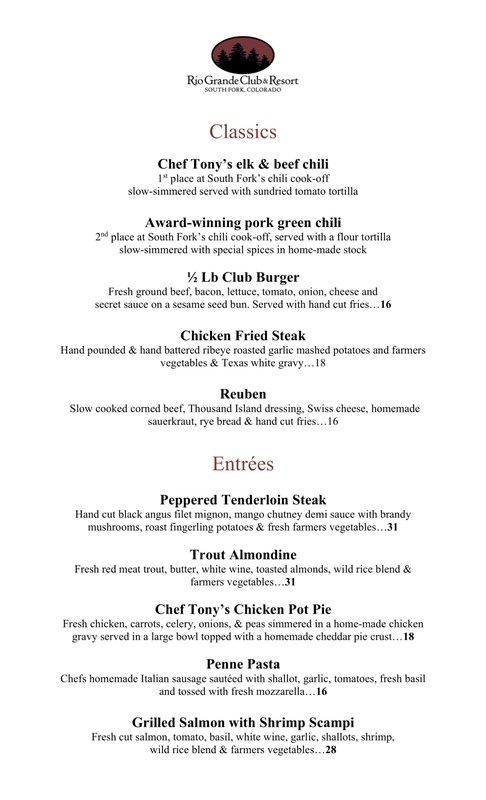 Consider yourself invited to RGC's happy hour held every Friday from 5 - 7 pm. 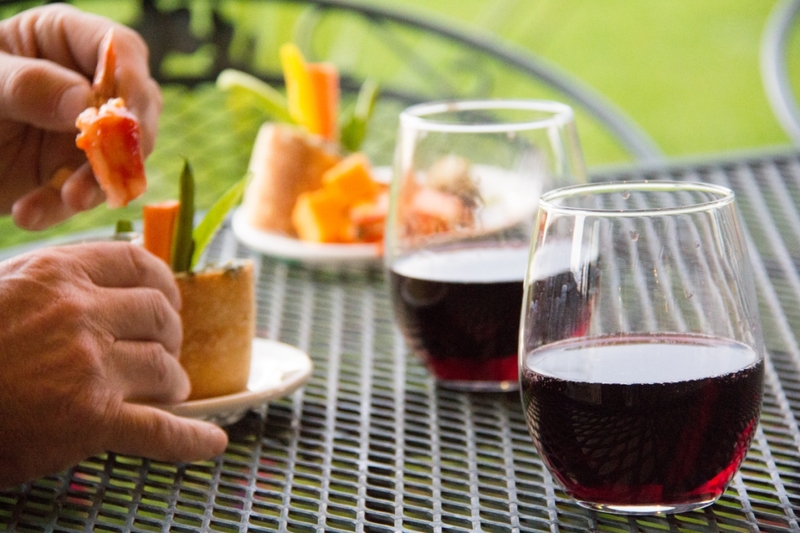 Members can enjoy a spread of complimentary appetizers and non-members can partake for $10. Enjoy the views, the relaxed atmosphere, a cocktail or two and some friendly faces. 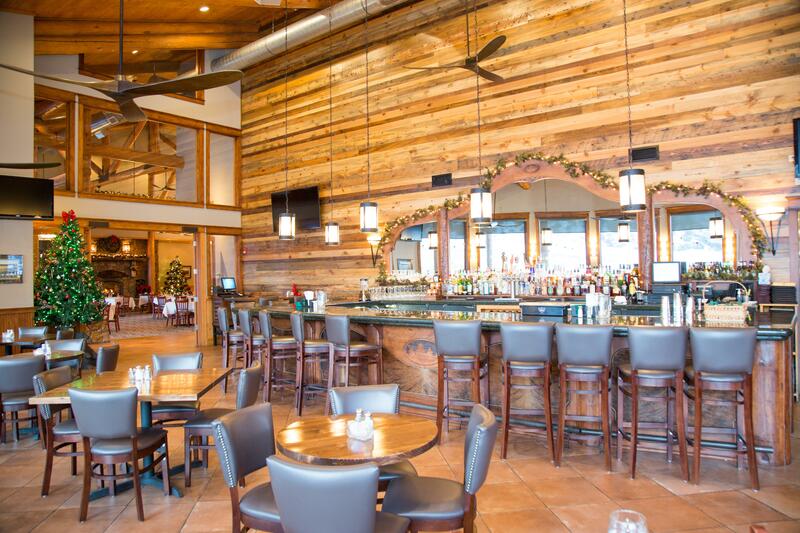 Lunch service in the Big River Grille will resume in the spring. 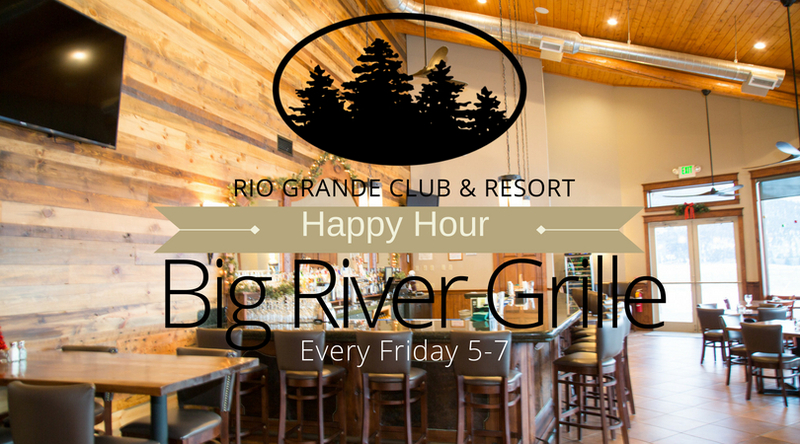 Join us every Friday for happy hour in the Big River Grille from 5 - 7 pm. Members can enjoy the complimentary appetizer spread, and non-members may also partake for $10. 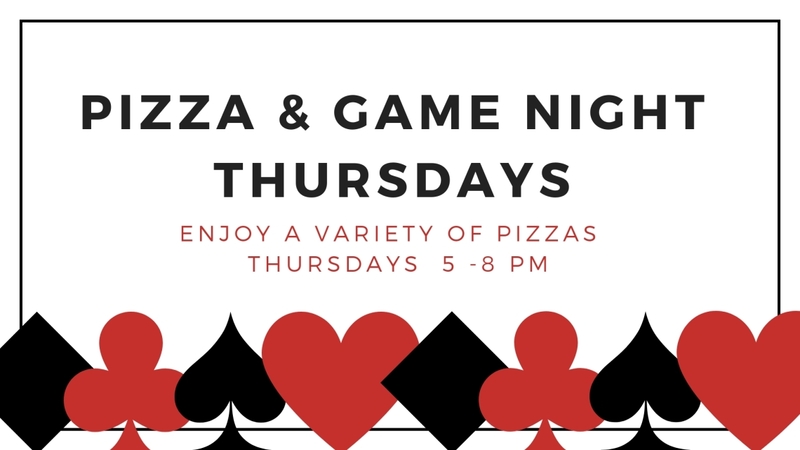 Join us in the Big River Grille for game night on Thursdays from 5-8 pm. Games range from trivia, Texas Hold'em, blackjack, bunco, or other laughable activity attendees come up with.